Montgomery County, in central Alabama, is part of the state’s River Region and is home to the state’s capital city, Montgomery. 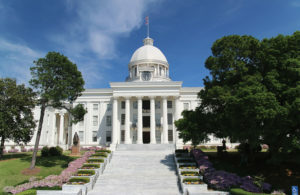 Beyond state government and all the interest groups that flock toward it, Montgomery has a historic legacy as the birthplace of the Civil Rights Movement, which brings visitors from throughout the world, and is home to Maxwell-Gunter Air Force Base, the area’s largest overall employer, and Air University, the intellectual and leadership center for Air Force professional military education. It has an extensive service industry, wholesale and retail trade, several colleges and universities and an industrial base that includes Hyundai Motor Manufacturing Alabama, the area’s largest industrial employer. Hyundai makes the Sonata and Elantra sedans and the Santa Fe SUV in Montgomery. Automotive suppliers are located nearby to support it and the state’s other auto plants. The city is strategically located at the intersection of Interstate 85 and Interstate 65, with the Alabama and Tallapoosa rivers running through it. The state’s latest (2017) report of new and expanding industries ranked Montgomery third in new job announcements. The report showed Montgomery County had six new companies and 24 expansions for a total of 1,056 new jobs and $204,929,270 in total investment. Since that report, Montgomery also has seen a $388 million expansion at Hyundai. Montgomery has had a lot of successes. One of the most recent is the Air Force’s choice of Dannelly Field and the “Red Tails” legacy unit, the Alabama Air National Guard’s 187th Fighter Wing, to serve as a strategic location for the new F-35A Lightning II fighter jet. This secures the future of the Alabama Air National Guard and ancillary units that will be involved for decades to come. More than 1,400 individuals make up the wing, which has an economic impact of more than $80 million annually over the last five years. The economic impact is expected to increase to more than $100 million annually upon receipt of the F-35, with an upfront capital investment of over $65 million. Another major development is the continuing success of the Montgomery Internet Exchange, MGMix, which is the state’s only internet exchange and one of only a few in the Southeast. There already has been a major upgrade to handle 100 gigabits-per-second traffic, placing it among the ranks of very powerful exchanges and attracting partners that move large amounts of data. The joint project is led by Maxwell-Gunter, the city of Montgomery, Montgomery County, the Montgomery Area Chamber of Commerce and Retirement Systems of Alabama. TechMGM, a chamber initiative, is focused on growing Montgomery’s distinct economy by leveraging its local and regional industry and resources, cultural attributes and talent to pursue and promote technology advancements, inclusive growth and enhance access to capital. And MGMWERX, an innovation hub of DEFENSEWERX, officially launched in downtown Montgomery to introduce its mission to defense and regional leaders during the Air Force Information Technology and Cyber Power Conference. Established under a Partnership Intermediary Agreement with the Air Force Research Laboratory and Air University, MGMWERX augments ongoing Air University programs and will integrate concepts and technology from the private sector to enhance production of high-quality, innovative research and ideas that address issues of importance to the Air Force. Tourism is major here, and Civil Rights tourism continues to grow. In April 2018, The Equal Justice Initiative, a social justice law firm based in Montgomery led by Bryan Stevenson, opened the National Memorial to Peace and Justice and the Legacy Museum. The opening events of this double-feature civil rights experience attracted celebrities and about 25,000 to 30,000 people from around the world. In total, more than 300,000 people have visited the area to see these new attractions, as well as other Civil Rights museums and historic sites. Downtown, with its many historic sites, also is growing by leaps and bounds. Several hundred new apartments, lofts and condos are online, with more mixed-use developments under construction. At least five more hotels are under construction or being planned. The city’s investment in its sports facilities has resulted in major sports events coming in, including the Raycom Media Camellia Bowl, televised by ESPN. Lori Chandler Pruitt is a freelance writer for Business Alabama. She lives in Birmingham.